MB Color Test is a highly accurate and easy to use software that provides a fairly accurate analysis of your personality. This software is based on the fundamental principle of colors representing your changing moods and hidden desires, which will help you to understand your present situation. The purpose of this simple, interactive software is to provide an analysis of your present situation and also help you pinpoint your actual problems in life, which might enable you to undertake suitable remedial measures. MB Color Test is an effective online testing tool that attempts to throw light on significant aspects of the human personality. 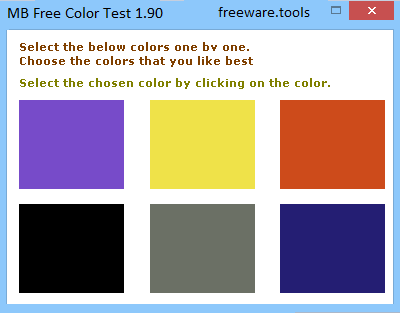 MB Free Color Test is a a tool designed to be a highly accurate and easy to use predictor of your personality. MB Free Color Test is based on the fundamental principle of colors representing your changing moods and hidden desires, which will help you to understand your present situation. The purpose of this simple, interactive software is to provide an analysis of your present situation and also help you pinpoint your actual problems in life, which might enable you to undertake suitable remedial measures. MB Free Color Test is an effective online testing tool that attempts to throw light on significant aspects of the human personality. This test is based on the lifetime research conducted by Dr. Max Luscher, and successfully draws attention to areas of psychological and physiological stress in an individual's personality. The Color Test is used extensively by physicians, particularly psychologists, as well as by researchers and corporate organizations that wish to understand the personality profile of a probable recruit. Since the 1950's, this test has been administered by hundreds of thousands of people all over the world. MB Free Color Test is a completely free online test, and the best part lies in the fact that it can be administered within five to eight minutes, making it one of the fastest online tests to be ever administered. All that the user needs to do is to select a single color one by one from a selection of eight different colors. As you click on one color, it disappears from view. After you click on all of them, the colors again reappear after a minute. You need to select them once again, and not necessarily in the order in which you selected them in the first round. These selections should be made randomly, just as you would choose colors for a new car or your bedroom curtains. Violet - You are a sentimental person, one who has a longing for emotional tenderness from a loved one. Your search for a romantic partner actually translates to a need to identify with someone and depends on a desire to gain support through your partner's charm and social reach.